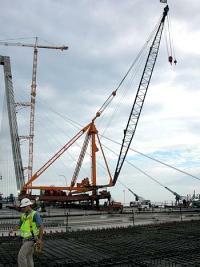 During the growth of the deck, there were 4 cranes, one located at each end of each deck. Philip Cotter named one of them "Last Dinosaur Standing" and I have a few photos of this animal. 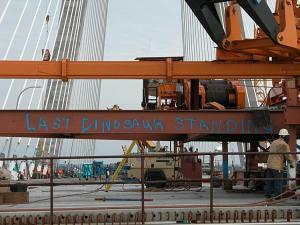 I was told that each crane was an antique - over 100 years old. I've not been able to confirm this, but perhaps it is correct. If so, then these cranes have seen many projects and I can imagine the stories they have to tell. I have assembled a few photos of the Last Dinosaur Standing and placed them near the end of the close-up page. Perhaps someone knows more about these creatures? If yes - don't keep it a secret. Many of you have discovered this page - an exploration of using a blog (webLog) to express some of the content of these pages. I discovered blogs from my IT Lab brain trust - a group of the greatest and friendliest guys at MUSC. I was reluctant to engage this new tool - but as the bridge web site spun out of control, some sort of organization was necessary. This blog is a test of whether I can maintain some sort of links with photos that are posted to different sections of the site and maintain a 1-way dialog with all of you. If you have not encountered blogs - it is the tool that is transforming web resources from read-only to read-write. Blog tools permit individuals to post thoughts and observations to the web without the geek-skills necessary to manage a web site. This morning I ran across an article that addesses Blogs in education. The thoughts parallel my thoughts about Internet-centric learning (see also Restoring the joy of learning ) and the evolution of the bridge web site - as a learning tool. I suggest you check it out and share your impressions with me and your friends.